We have two day rides that may be your best motorcycle rides of all time. If you only have a short time in Auckland, this ride is a must do for any motorcycle enthusiast. Stunning roads and scenery provide you with an unforgettable experience. Contact us to enquire about this ride. 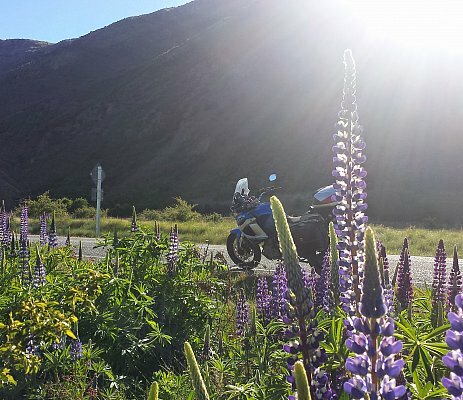 The Coromandel is a gem in New Zealand motorcycle touring. It's steep forest clad interior is outlined by a coastline that has some of the worlds best beaches such as New Chums Beach, Cathedral Cove and the fabulous Hot Water Beach, where after a long day in the saddle you can simply dig a hole in the sand and enjoy a hot spa! A Ride in the Shire Bilbo? A ride that will no doubt get those big hairy feet skimming the tarmac on the way to Hobbiton. Just to say thanks again for your service and hospitality. We had a great time riding NZ and hope to complete the tour in the next few years. I meant to ask you where you got the fork brace on vstrom from as I havent even seen them advertised over here.